This is an active holiday for people who like it quiet. You stay at our 230-year-old farmhouse, the Dormouse house, in a quiet village on the edge of the well-known Lake Cerknica. The house is fully renovated and equipped with old furniture; with just enough modern commodities to ensure a pleasant stay. The thick stone walls ensure an absolutely quiet atmosphere. Here, you can, as we say in Slovenia, “sleep like a dormouse”. Every day, you go on day trips in the surrounding hills and forests, in the company of our guide. We like to reduce the use of vehicles and on the first day, we will be walking from the Dormouse house through the Dinaric forests. In the afternoon, we reach the cave Križna jama, which is known for its underground lakes. After a one-hour visit to the cave, we will ensure transfer back to the Dormouse house. The second day we will be going higher up, as we head for the highest mountain of the Notranjska region! 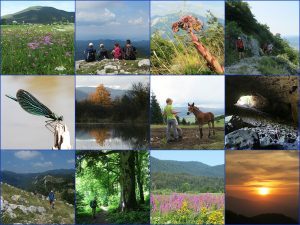 From the peak, which is a botanical reserve, we have a wide view over most of Slovenia. On the third day, your guide will take you to the valley Rakov Škocjan. Once a cave with an underground river, it is now a beautiful valley through which the small river Rak flows. The tour program includes accommodation, all meals, guiding and transport. Every day, we have lunch in the form of an outdoor picknick. For this, we take locally produced ecological food with us in our backpacks. Dinners are served at a nearby ecological farm. On our walks, we cover 10-15 km each day. We follow unpaved forest roads and undemanding paths. In some places, we will go steep up- or downhill, but the trails are safe and do not involve climbing. Today’s schedule depends on your arrival time and place. Included in the program is that we can pick you up in nearby places like the Rakek train station and the towns Postojna and Cerknica. Alternatively, you can take a direct bus to the village Goričice, where we wait for you at the bus stop. Pickup at the Ljubljana (Brnik) airport is not included in this program, however, we can arrange to pick you up there for an additional fee of 30 Euro per person. Included in today’s program is dinner in a local ecological farm and, of course, check in in the Dormouse house, where you will stay during this tour. We start today’s hike directly from the Dormouse house. The surrounding hills are largely covered with forest. In fact, this forest continues all the way to the southern Balkans and is part of the largest forest complex in central Europe! Here, we hike over unpaved forest roads and smaller trails. The forest provides shade on summer days and the surrounding landscape offers beautiful views along the way. After a while, we reach an old church on the top of a hill. Here, we have our lunch. For this, we brought food along, which is home-made at a local farmhouse. After our lunch, we hike downhill, because lower down on the same hill-with-a-church, we find one of the most beautiful caves in Slovenia: Križna jama, the cross cave. Križna jama is a water karst cave which is known for numerous underground lakes, remains of cave bears, archaeological remains and for its special cave fauna. Before we enter the cave, we are equipped with rubber boots and special cave-lights, which we get from our guides. The cave itself has no lights and is only minimally adapted for visitors. Much of the path goes over natural rocks and in some places, it can be muddy. On our underground hike, we cover about one-kilometre distance, until we reach the first underground lake. A boat takes us over the lake and back. Afterwards, we return over the same path. From the cave, it takes us just under one hour to reach the farmhouse where we have dinner. We expect to arrive here well in time, so we can enjoy coffee or tea on the terrace. On today’s hike, we visit the highest Slovenia mountain outside of the Alps, Mount Snežnik! In order to reach the mountain, we drive through a lovely forest. In some places, winter storms have felled many trees. The vegetation is now recovering and we expect many flowers in summer. We start our hike halfway up the mountain, in the middle of the forest. Our hike takes us all the way up to the peak, which has an altitude of 1800 meter!. On the way up, we see the landscape changing. Trees become smaller and hive way to low mountain pines. On the top itself, there is just a short herbaceous vegetation, full of flowers. The limestone underground is porous, and there is no surface water anywhere. However, from the top we can again see water: far away the Adriatic sea is glittering in the sunlight. The limestone underground in Southern Slovenia is like an Emmenthaler cheese: full of holes. In fact, over 13.000 caves have been found until now and new caves are regularly discovered. Long ago, the ceiling of one of the largest caves became unstable and eventually collapsed. In this place, we now find a lovely small valley called Rakov Škocjan. Today we hike through this valley and witness the ongoing processes which lead to the formation of this landscape. Our hike goes through a hilly landscape and while we go up and down, we do not face large altitude differences. We follow a lovely stream and hike mostly over smaller forest trails. Along the way, we see caves, springs and lovely small meadows in the middle of the forest. 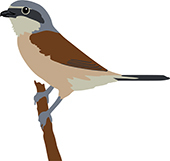 The duration of today’s hike depends on your (flight) schedule: it can either be a half-day hike or a whole-day hike. The price of this hiking tour is 595,- € per person, for groups of 2 or more participants. When there is only one participant, the price becomes 895,- €. 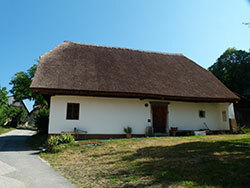 This price includes 3 nights accommodation in the Dormouse house, all meals, transport in Slovenia and guiding. The price does not include aeroplane tickets, travel insurance, any private expenses, alcoholic drinks and transport to and from the airport. We can come to pick you up free of charge at nearby points like the Rakek train station, and the towns Postojna and Cerknica. For an additional fee of 30 € per person, we can pick you up in Ljubljana or at the Ljubljana (Brnik) airport). Your guide will be Paul or Jana, who are licensed local guides and naturalists, living in southern Slovenia. They speak English, Slovenian and Dutch. During this tour, you will stay at out authentic Slovenian farmhouse “the Dormouse house”, which accommodates up to 5 guests. See the tab “Holiday House” on this website for more information. We think that tasty, high-quality meals are a very important part of any tour! Where possible we prefer it when we can eat local dishes, based on locally produced ecological products. Often, we include seasonal fruits and other farm products. Breakfasts often include home-made bread with pršut (Slovenian wind-dried ham), cheese and eggs from local farms, as well as home-made marmalade and Slovenian honey. Lunch during our tours is often a tasty picnic, which we enjoy in a beautiful, natural area. Such a picknick consists of delicious home-baked bread and a variety of local products depending on the seasons together with home-made juice and Slovenian tea. Dinner is usually served at a nearby ecological farm. Have you every tried Slovenian štruklji, which are a delicious kind of dumplings, or ajdove zganci, a buckweed-based food – a Slovene staple from the old times? We can provide vegetarian meals and of course take any requirements into account which you may have, like allergies and based on religious beliefs. We will ask you about this sometime before the start of the tour. Sometimes, it means that we will have to buy ingredients which are not available locally. Moderate: we will be hiking 10-15 km on each day. We go uphill and downhill, largely on unpaved roads and trails.